The content marketing industry is flooded with “rock stars,” and this has led many to think a content marketing strategy is about individual prowess. But this couldn’t be further from the truth. Peek behind great content marketing efforts and you’ll nearly always find a driven, well-organized team. Jolie Miller, content strategy and acquisitions leader at LinkedIn, has spent much of her career leading the quiet, disciplined work of high-performance content teams. Here are her practical tips for what it takes to build, manage, and drive them. CCO: Can you paint a picture of your personal content journey? When did you first take the creation of content seriously, and what about the process did you find (and do you still find) interesting? Miller: I started in the content business over 10 years ago in the publishing world, where our product was educational content. One of the things I was most excited about then and have only grown more passionate about now at LinkedIn is the idea of over-delivering on value with the content you share. It’s content that truly exceeds users’ expectations that creates those moments of delight with a brand. What I love about content is it has the power to change people’s lives for a second or for a day or forever. Great content creates space for people to pause and reflect, and that space is where transformation happens. CCO: Not all teams are high-performance teams. In your mind, what’s the difference? Miller: A high-performance team has members that show up for each other because everyone wants to work together to deliver value. People do the small, little extra thing and the big, hard, amazing thing, and obsess about the details because they’re creating relationships and outcomes they’re willing to own. I’ve been fortunate to be on many teams like this. In my experience, a team that’s not high-performing is a team that’s in it for the transaction – one project or one piece of content or one interaction, not the longer play of strong, healthy relationships, open communication, trust, and creating a better company together. It’s more about how quickly can I cross this off my list or get through that conversation and back into my day; it’s not about building something together with and for people. Needless to say, these teams quickly get toxic for people and can benefit from a fresh start and some turnaround leadership. 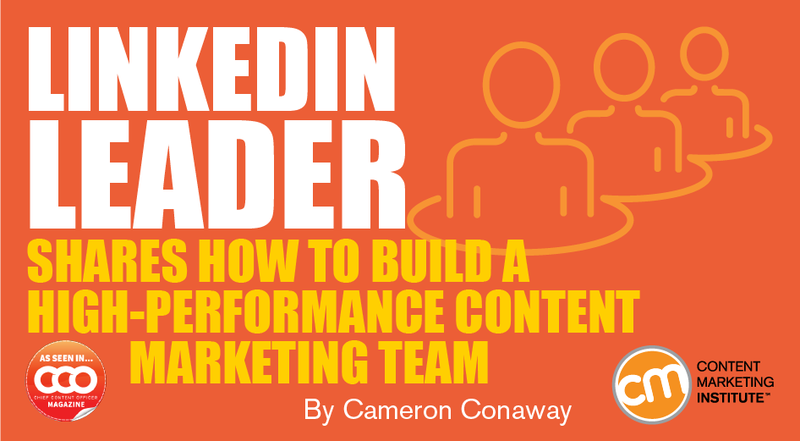 CCO: You’ve built high-performance content teams at all stages of a company’s growth. Can you walk us through the crucial first steps a leader of any company size should take to begin building a world-class content team? Miller: It really starts with knowing what markets you want to win and what kind of content, delivered in the right way, will help you win those markets. What the business is aiming to do and do well is at the heart of starting your team. Then you’ve got to find people who want to join the cause with you. I often tell candidates that this isn’t a job, it’s a calling, and we’re looking for people who want to own and share that vision with us – people for whom it’s not going to feel like work. Creating good content is about passion. I also often tell candidates that it comes through in the content you make if you had fun making it – the company’s culture bleeds through, and it has to be solid. So you’ve got to find folks who want to have fun growing a business with you. Look for the people who you know will challenge what exists and what could be, and always seek out folks who will want your job. They’ll drive hard toward company wins with you. CCO: Once the core team is in place, what are some simple project management strategies that will help the team keep driving forward? Miller: The first project management strategy for any team is communication. Notice people. Notice things that are going right. Say something about those things, often. Have the tough conversations with candor and empathy, and have them earlier than you think you need to. I’m also a big fan of documentation and detail to stay on top of projects – over-document if you need to get in the habit. You don’t need a fancy CMS or tool to do this; it can be done in Google Sheets if that’s what you’ve got. But keep track of all the little niggling things. Next, it matters what you measure – so keep detailed records and monitor performance. I like to monitor the daily stuff: engagement and viewership, but also hunt for wild-card information that might start with a random question, take you down a rabbit hole, and then kick you back out with some new insights. Finally, have review meetings or postmortems on a frequency that works for you. Stop to ask yourself: What’s going well? What have we learned? What do we want to do next? This is key. CCO: Where do you see most content marketing strategies faltering? Miller: Content that misses the mark usually does so first by failing to know its audience, and second by failing to connect meaningfully with that audience, either with the wrong tone or wrong type of content or a combination. The miss often occurs long before the content is made. The other mistake I see is applying a one-size-fits-all approach to all of your content without stopping to consider audience differences, such as: “This two-minute clip worked well over here for this audience so we should obviously only do this for everyone going forward.” Not so! CCO: When do you know it’s the right time to hire, and can you give us a glimpse into how you recruit the best-fit talent? Miller: In my experience, the right time to hire is when you’re in over your head with too much on your plate but still have the energy and passion to do it all – it’s still early enough that you’re not burned out but it’s late enough that you hopefully have traction and cash flow to attract the kind of people to help you get to the next level. Then, and this is the key thing, you have to fire yourself from your old job of doing it all. Hire someone who’s amazing, train them really well and thoroughly, and then let them run, coach them, and remove all the roadblocks they need cleared out of their way. If you give me $100 to spend on hiring, I’m going to spend half of it finding the right person and the other half making sure my training documentation is compelling and setting the person up for success. Without both of these, neither one will work. Jolie explains why these five steps are essential to creating a high-performance team. I’m a big fan of passive candidate recruiting – going out and finding the voices that should be shaping the content of tomorrow. See what’s new and fresh on social and who’s doing unique and game-changing things, the people who are thought highly of. Talk to those people. Network. Find the best and go to them, even if they’re not looking and wouldn’t consider leaving where they are. Start talking to these people before you have roles open so you can quickly hire when it’s time. I’ve often interviewed people by letting them ask me questions rather than throwing a bunch of questions at them. This lets me see how their mind works, how curious they are, if they’re prepared, and the way they’d think about working with me and the team. Their approach also lets me observe their analytical and emotional-intelligence skills up close and personal – how are they reading what I’m asking, and are they catching how I’m responding to their answers and adjusting on the fly? It also ensures that candidates are getting the full scoop on the job – they have ample opportunities to learn everything they want to know, and in the best circumstances, and also sell me on their big ideas that would let them hit the ground running. Of course, I do throw in some questions of my own, but the goal is to get to know the candidates – are they nervous to fill the time with questions and their own thoughts, or are they eager to take charge? Do they use the time to try to get ideas for how to answer the next interviewer’s questions or do they use the time as a blank canvas to brand themselves? Whether it’s their humor, their brilliance, their grasp of numbers, or whatever it might be, you want a delight factor that they can bring to the team and the business. This is a daily relationship you’re committing to, and it needs to work well and be able to drive results. Set up clear onboarding plans for the first 60 days, including goals for the quarter or the year, and documentation on how to do what. No one remembers what they do in their first week, so have a document they can peruse at their leisure any time to refresh their memory.